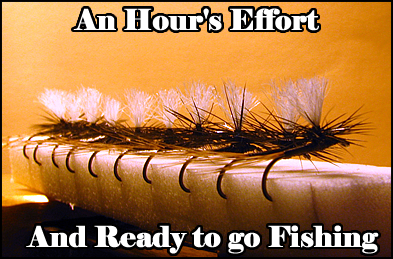 « Fly Fishing and the Marketing Dept. 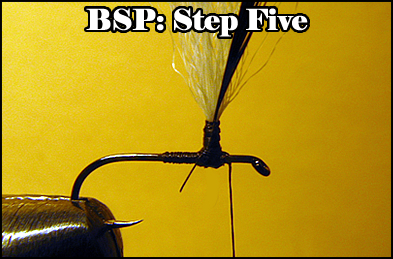 There are only a few variations of basic fly tying patterns which I use consistently. Certainly I have heaps of size and colour variations but the same old same old things work and keep working and I sort of figure “why fix it if it ‘aint broke”. 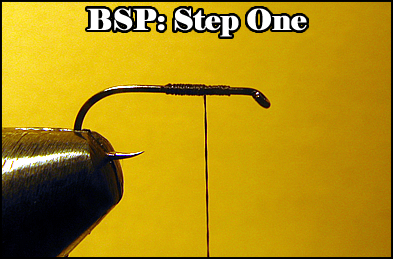 The BSP is one of those patterns, driven by the fishing guide’s need for simple and quick to tie flies that are at the same time effective, relatively inexpensive to manufacture and durable. It helps a lot that if a client hangs one in a tree you don’t have to choose between a long swim, bankruptcy or ritual seppuku. 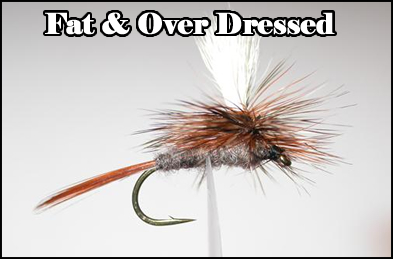 Parachute patterns in general have a number of advantages to the average angler and despite the fact that standard Halfordian or Catskill ties have been around for years and are still viewed my many as the “standard dry fly” I personally fish very few Catskill ties these days. They have the annoying habit of landing upside down just as you manage to make that impossible cast into the bushes over a twenty inch fish and I demand a little more reliability at least when I can. Firstly parachutes are not as limited by the dimensions as a Catskill tie is, make the tail too short on one of those and it falls over, make the hackle slightly larger and it will twist up your tippet like a dervish. Real Mayflies, Midges and Caddis flies actually vary considerably in their dimensions, not just size but the relative sizes of their wings, tails etc and that is not easily copied with standard ties. With the parachute style one has almost complete freedom to vary those dimensions without mechanical failure, no matter the variation the fly lands the right way up most of the time and with modern materials as wing posts they are as visible as the proverbial canine’s naughty bits. 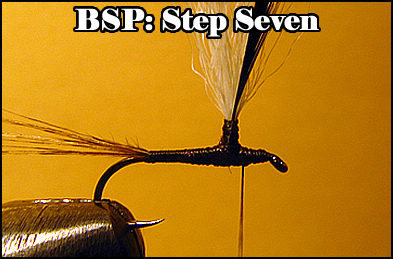 Emergence of parachute patterns have however out of convention followed many of the “rules” of the more standard dry flies, dubbing and quill bodies, standardized hackle sizes and the like, much of which can be pertinent but not always. Most of the natural insects on the small streams which I fish are tiny, and with that, skinny and sparse in nature. The majority of commercial patterns are by default over dressed, abdomens are too thick, hackling is too dense and the multitude of materials required frequently gives the patterns something of a portly and unnatural aspect which can be counter productive when fishing for selective trout. 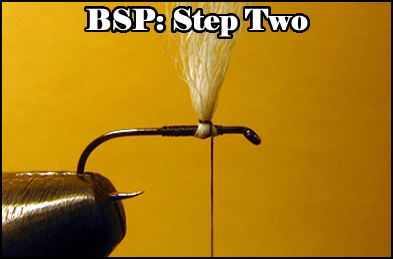 The image of the commercial Adams below also shows a whip finish at the head, a more traditional way of doing things and definitely less durable and less realistic than the method shown for the BSP. 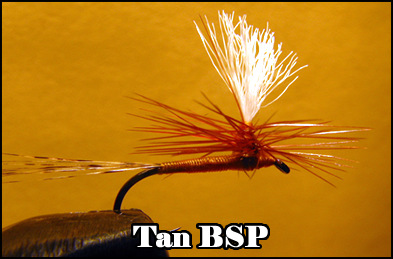 Mostly I find that sparse is better and sparse parachute patterns float better and are more visible than sparse Catskill ties, primarily because there is more of the hackle in the surface film in the first place. Many commercial patterns are overdressed and unrealistic. 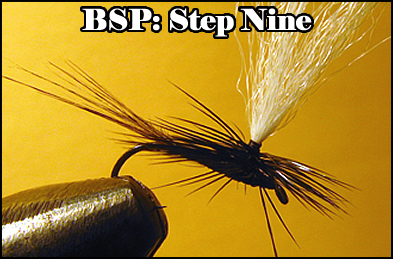 Of course there is never one answer, particularly when it comes to flies and fly tying but these patterns are quick, simple, inexpensive and durable, not to mention effective. The style lends itself to tying in smaller sizes much needed on our local streams and with a bit of practice you can churn them out in various colour combinations to cover a lot of hatches both mayflies and midges.. Since the publication of that title however there is one change that has been made to the way that I tie these flies and I now loop the parachute post around the hook. It took a while to get that right but now is more effective and provides a slimmer profile to the flies, something that I am always aiming at due to the skinny aspect of most of our stream’s insects. The flies are tied with only variation of thread and hackle colours, I almost universally use Coq Du Leon feather fibres for the tails, they are long, shiny and easy to use. The abdominal colours come directly from the thread which gives one a massive amount of variety at low cost. Occasionally I will use bright coloured poly-yarn for the post for added visibility in poor conditions but that can sometimes spook the fish. Hackles are generally one colour but of course one can do the “Adams” thing and have two different colours if you wish, the process is pretty much the same. Wrap the thread (usually 70 denier on the smaller patterns that I tie) approximately half way back the hook shank and bringing it back towards the eye leaving a gap for the “head” of the fly. 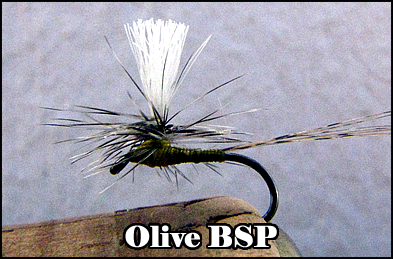 On mayfly patterns in particular I prefer a more “Thorax style” with a decent amount of shank in front of the wing. Real mayfly wings do not stick out of their heads and there is a portion of the insect in front of the wing which I find hard to ignore. 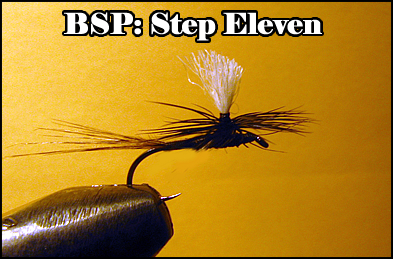 (Another variation from the normal Catskill style of fly pattern and to me an advantage in realism). Loop a thin section of poly-yarn under the hook and double it over to form the post, one can position the post exactly where you want it done like this and get a very slim body at the same time. The trick here is to flip the bobbin around the “back” of the post with your left hand (for right handed tiers) and make a wrap around the post. Some “figure eight” wraps around the base of the post and the hook shank will secure it without undue bulk. Then wind the thread in touching turns up and back down the post, this is achieved by holding the post with the none tying hand briefly on each wrap and pulling the thread tight, then backing off the tension slightly for the next wrap and so on. Done like this it won’t all spin off the post. With two wraps of thread (one up and one down the post) it will be stiffer and further wraps will become easier to achieve. Catch in the stalk of a hackle (I prefer to use saddles which allow the tying of multiple flies without constantly selecting a new feather). The stalk should be stripped to the sweet spot on single hackles. 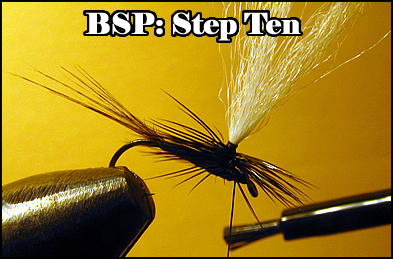 Use only one thread wrap to trap the hackle in place. Then wrap in touching turns up and back down the wing post trapping the hackle as you go. 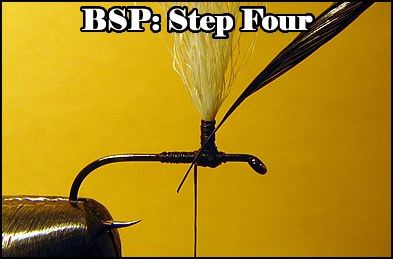 It is preferable to have a short amount of bare hackle stalk at the top of the post so that the first half wrap to wrap of the hackle is stalk only, this makes for a neater finish in the end. With the hackle tied in place make touching turns of thread along the abdomen, catching in the remainder of the hackle stalk along the hook shank. Done like this you save the trouble of cutting it off and at the same time add a nice taper to the abdomen whilst stabilizing the post. Tie in a bunch of Coq Du Leon fibres for the tails, you can of course use split tails or whatever but this is the fastest and simplest approach. Wind the thread back in touching turns along the shank, trapping down the butts of the tail fibres and trim them when you get to the post. A thicker body can be achieved by adding a second layer of thread should you want that. Take the thread past the post and build a neat “head” of thread on the shank returning the thread to the base of the post and then IMPORTANTLY, make one wrap of thread around the base of the post so that the thread is now wrapping around the post and not the hook shank. 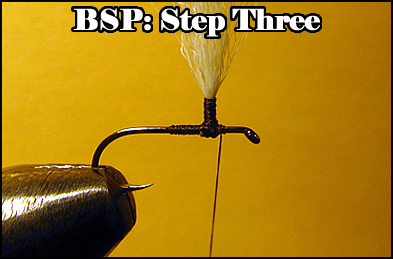 This will be important in a moment when you trap the wound hackle to the post. Tip the hook shank slightly downwards in the vice as this makes winding the hackle easier than simply winding completely horizontal. Wrap the hackle in touching turns down the post, this is a far stronger and neater way of tying in the hackle than the commonly used method of winding it up and back down again. Done like this the hackle will not slip off the post after a fish or two. 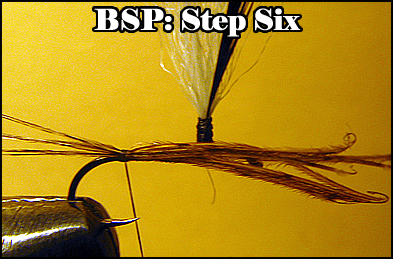 Leaving the hackle pliers hanging on your side of the hook catch in the hackle to the post with a single wrap of thread and trim the excess. Touch a few millimeters of thread with super glue on a brush to wet it and make two wraps carefully around the base of the post catching in the hackle at the same time. (A super glue whip finish). Pull the thread tight supporting the hook for a moment for the glue to take and trim the excess thread. Finally trim any fibres which have been caught in the thread and are pointing downwards, and there you have it, a Bog Standard Parachute fly. Once into your stride you should be able to tie around a dozen an hour, maybe more. Changing thread and hackle colours you can imitate almost any midge or mayfly in suitable sizes. 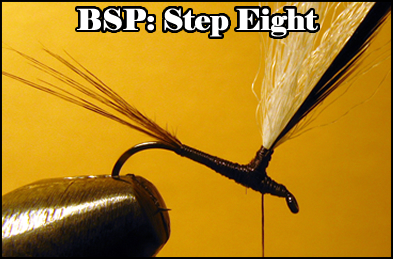 Certainly this probably isn’t going to win any “most complicated fly” competitions, but they are highly durable and effective and will offer you options to cover any number of different hatches. Variations: Obviously colour variations are easy to achieve and with the wide variety of thread colours available you can let your artistic skills run riot. In addition, coloured posts for greater visibility, longer posts also aid sighting the fly on rough water. You can of course dub the bodies, use ribbing or even quill and hackle stalk for the abdomens if you would like to. A twist of dubbing around the thorax and head will give neater finish on quill bodies but mostly I use these simple thread creations and they work just fine as they are. Disclaimer: From time to time these posts attract advertising, whilst the adverts may be pertinent to your needs and provide useful information to you, please do be aware that “The Fishing Gene” “Paracaddis” nor “Inkwazi Flyfishing Safaris” have any control over thier appearance or content and receive no financial benefit from the advertisers. The presence of promotional materials or advertising other than within the content of this blog does not imply any sort of association or endorsement from those persons or organisations producing or providing content for this blog. This entry was posted on March 28, 2011 at 9:00 am and is filed under Uncategorized. You can follow any responses to this entry through the RSS 2.0 feed. You can leave a response, or trackback from your own site.